The 25th of November 2018, marks an exciting day for Gretna Green, The Original Home of Romance; as it hosts a special handover ceremony, showcasing a new addition to our Famous Blacksmiths Shop Museum. We will celebrate the instalment of a glorious 21st century wedding dress, representing its generation alongside our current exhibition, one of which dates back to the 1700's. The latest dress to join our collection has been donated by Catherine and Thomas Sutherland who "tied the knot" at Gretna Green after falling in love with the history, heritage and story of the Famous Blacksmiths Shop. "After visiting the museum, I was so impressed to see actual wedding dresses displayed from many years ago. The brides who stood on the same spot I did on 23rd May 2018 made our marriage very special as well as being part of Gretna Green's History. The wedding dresses on display are of a different period in time and I thought if I donated my dress it would provide a much more modern take of brides in this century. It also means that I can come and visit my dress at any time and that it will still be there for many years to come." This new wedding dress will sit alongside our current collection of vintage gowns, including, the dress worn by the Great Grandmother of Alasdair Houston, Mrs Mackie's on her wedding day in the 1930's. "We're so touched to have one of our couples donate such an important part of their wedding day to the museum. The Dress is so important to many brides and really showcases their individuality and style and this donation is a real testament to the emotion and romance that is woven into the Original Marriage room here at Gretna Green. We're delighted to be able to showcase a modern dress from a bride who married recently within our walls." 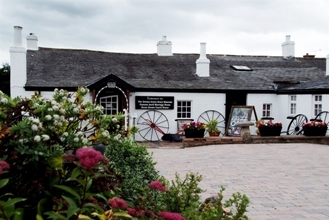 Gretna Green will take delivery of the dress at The Famous Blacksmiths Shop Museum on Sunday 25th November at 12 noon and both Mr & Mrs Sutherland will be in attendance to officially handover the dress. We'd like to invite members of the public and the press to join us alongside Catherine and Thomas as we proudly take delivery of the dress and install it into our exhibition.